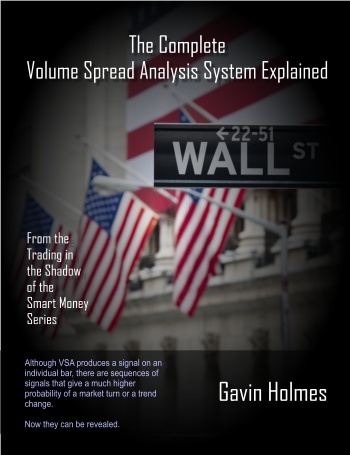 Through his years of trading and his experience of trading in harmony with the "Smart Money", author and professional trader Gavin Holmes has taken the Volume Spread Analysis methodology another step closer to the automated trading system every trader dreams of. By combining separate, discrete VSA Signals in to a coded sequence Gavin has been able to produce a series of very high probability, low risk trading setups which use set sequences of VSA indicators. For the first time the sophisticated world of VSA just got a whole lot easier to use in a practical trading environment. The book describes these sequences and how they work. It also provides a complete glossary of the VSA principles . Trading in the Shadow of the Smart Money. CLICK HERE to purchase now from the Tradeguider website.